Order your Xotic EP Booster Clean Boost Pedal from AMS and enjoy 0% Interest Payment Plans, Free Shipping, Free Extended Warranty & 45 Day Money Back Guarantee. What do the tones of renowned guitarist such as Page, EVH and Johnson have in common? They all used the legendary echo machine EP-3 as a pre-amp. 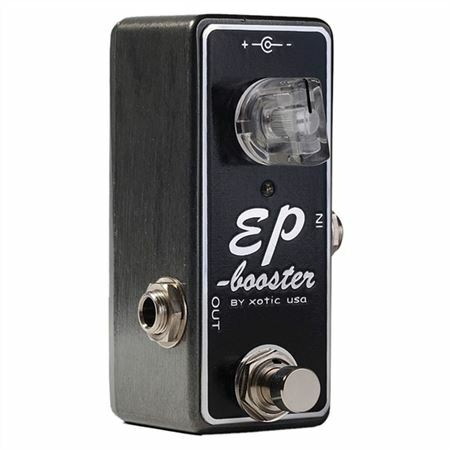 Xotic captured that magic in a new Xotic Effects pedal, the EP Booster. Xotic used the highest quality parts available with a discrete FET design and low impedance output, the EP Booster provides up to +20dB of unadulterated boost with multi-dimensional, shimmering highs and lows, and no ear fatigue. The internal DIP switches let you choose the boost frequencies, and EQ settings. A simple pure boost that pays reverence to the magical EP-3 and captures the celebrated tones of the world's most famous players. The EP-Booster,great tone starts here! True bypass for eliminating any signal interference when switched off. Can be used with AC adaptor (optional) or 9V Battery. it did color the tone ! well after reading all of the great reviews,i was expecting greatness! but no matter what pedal I put in front of or behind it took some high end out of the signal .even in the effects loop it did the same. it is good for some things,but not so good as a 'leave it on' pedal. makes my 1994 voodovalve preamp better,many compliments on my tone.leave it on .40+years of jazz rock country funk & of tejano . TEXAS STYLE !!!!!!!!!!!!!!! waited a bit before buying this pedal, found this was the one to complete my overall sound, gave my tone the edge it needed !! I have owned and given away(to my son) 2 of these.. if any thing happens to this one, I will buy another. Great clean boost on guitar and bass! Not completely transparent.But very little coloring to your tone.Works well as a boost or just leave it on all the time.Wonderful pedal! Reasonably priced. It does amazing things with humbuckers. Gets the job done with little coloration to my tone. The dip switchs are a nice feature for different applications. So far it works as advertised, I still have to test it with my Marshall CODE100! So far it works as advertised, I’ll be testing it with my NEW Marshall CODE 100 and see how well it works.